Beaches in India do not only mean a combination of sand and water. There is a whole gamut of other things that define their character and nature. Sometimes, it means hordes of chaat, toys and sugar cane juice sellers. At other times, a beach is about clear waters and palm trees, while for others it is all about adventure water sports. Of course, the underlining fact remains that beaches are a great way to spend some leisure time. India has many mesmerizing beaches spread across its vast territories. But if you are looking for pristine, then Daman & Diu beaches are your destinations. Situated in the north of Daman, the Devka Beach is one of the best places to visit in Daman. Having a very long coastline, this Daman beach is a hot spot for some family fun. The Devka Beach has a few rocky crops, and hence, swimming is not allowed in every part. However, if you really want to experience and enjoy at a Daman beach, then Devka Beach is really your type. The amusement park here adds to the entertainment and is a huge hit among children. The colorful fountains, a specialty of the park, are a bewitching sight. Food stalls and children’s play area add to the clamor and give you a wholesome experience. Sipping coffee or munching on a hot plate of fried fish with the sea in sight, Devka Beach offers a fun-filled outing. Trivia: This beach does not have golden sands, rather the beach is filled with black soil. Must Taste: The beach side shacks serve delightful seafood. You must taste some of their Prawn and Pomfret dishes. A contrast of sorts to the Devka Beach, Jampore Beach has a charm of its own. Situated at the southern end of Daman, this Daman beach is for those seeking some quietude. Here, there are no amusement parks or close-knit food stalls calling for your attention. On the contrary if you want to relax, swim in the cool waters of the Arabian and sit under the shade of the casuarinas plantations, then the Jampore Beach is your type. 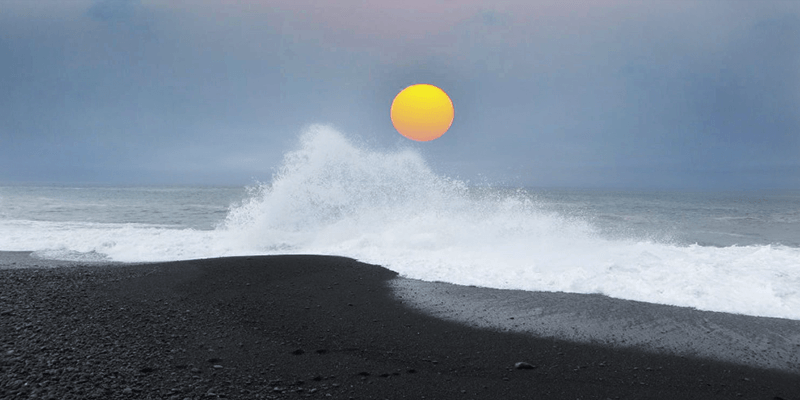 Quiet, resplendent, and relaxed are the best ways to describe the waves that wash the shore. Tip: The beach offers amazing sunset views, plan your trip accordingly. 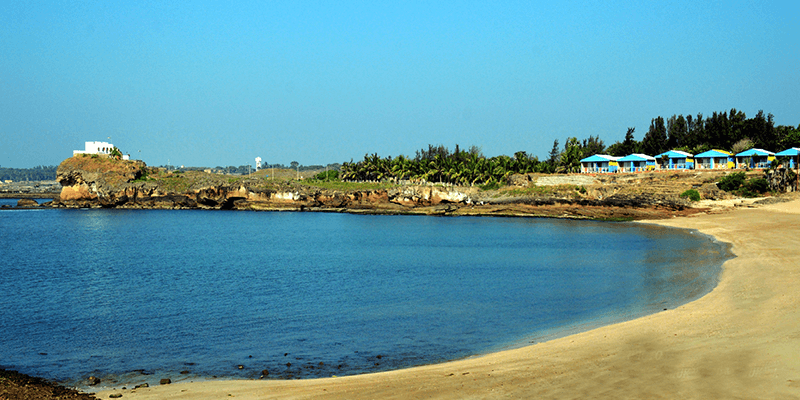 This tiny fishing village offers a splendid Diu beach experience. 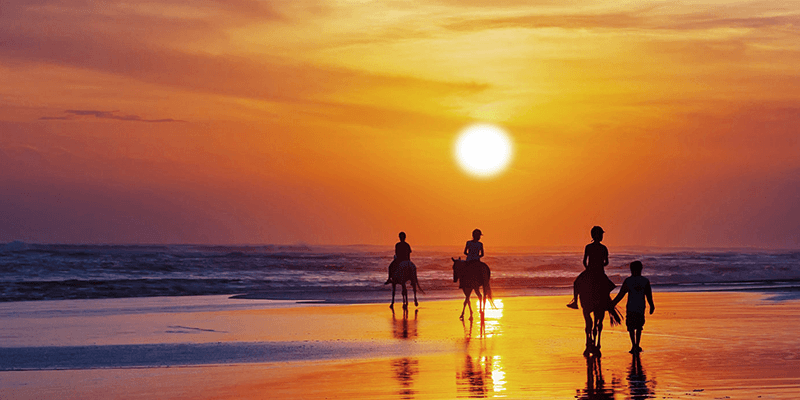 The horse-shaped Nagoa Beach is a prime tourist attraction and offers various scopes for tourists who enjoy extremes ranging from wetting their feet in the cool waters to parasailing, jet skiing and surfing. 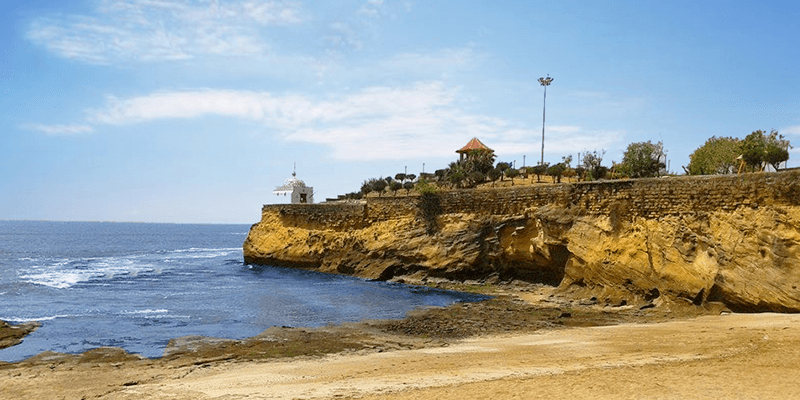 Dotted with coconut and corn sellers, the Nagoa Beach is the most popular places to visit in Diu and is a great way to venture into water sports and at the same time relax like an absolute listless being on a date with nature. Trivia: Nagoa means “New Goa”. During the colonial rule many Goanese families settled in the vicinity of this beach. Located more or less in the center of Diu, the Chakratirth Beach is for those who seek solitude. Quiet and different in its set up, with rocks strewn along the coast, this Diu beach has wonderful settings for perfect photographic moments. 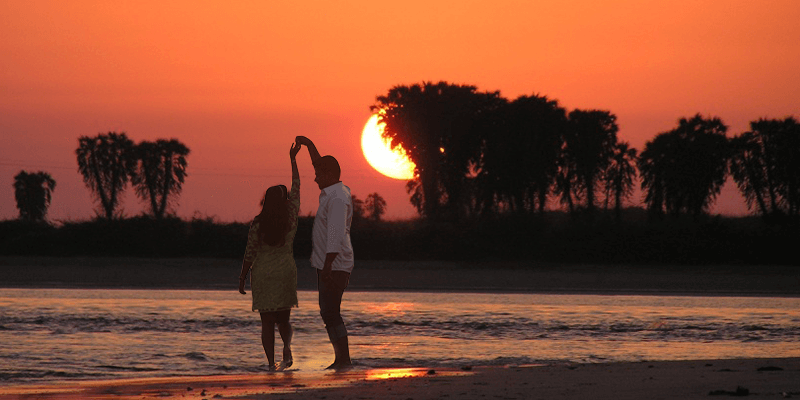 The Sunset Point of Diu is located on the beach and it goes without saying that there are no ways you would want to miss the sunset against the gorgeous backdrop of the hazel waters and flaming sky. The Auditorium and Gardens near Chakratirth Beach are worth a visit. Another added attraction is the visit to the small hillock called Bhanslo, which is accessible during low tide. Trivia: Chakratirth is named after a revered Lord Krishna temple near the beach. The temple has various mythological associations. 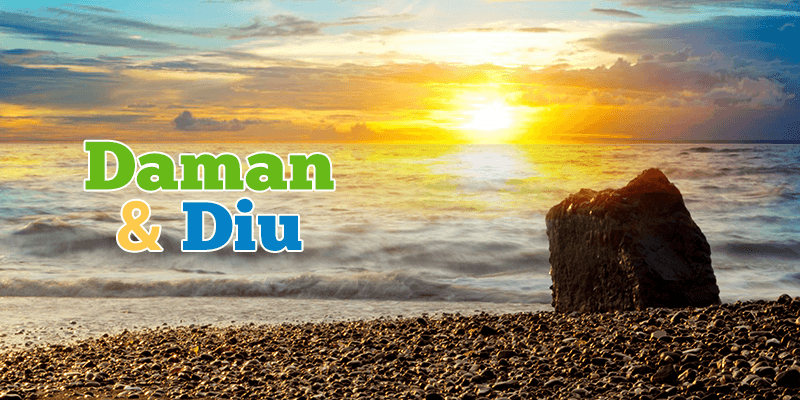 About 15 km away from Diu, the Ghogla Beach is another one of the places to visit in Diu that offers a relaxing experience. Not as crowded as the popular Nagoa Beach, you can partake all the water sporting activities here too. Ghogla Beach is an ideal destination to don your swimming gear and enjoy some time with the kids in the water. And guess what, if you are lucky enough you may also spot a few dolphins. Trivia: The beach has become a great destination for pre-wedding photo shoot. The Jallandhar Beach, lined with palm trees, is almost a real life imitation of the pictures drawn of beaches. Devoid of the crowd, serene and pristine, there is nothing more joyous than to watch the horizon through the leafy silhouettes of the palm trees. Trivia: Jallandhar Beach derives its name from a nearby shrine dedicated to a mythological demon. There is a stone carving of the demon – Jallandhar at this shrine. The demon was killed by Lord Krishna. 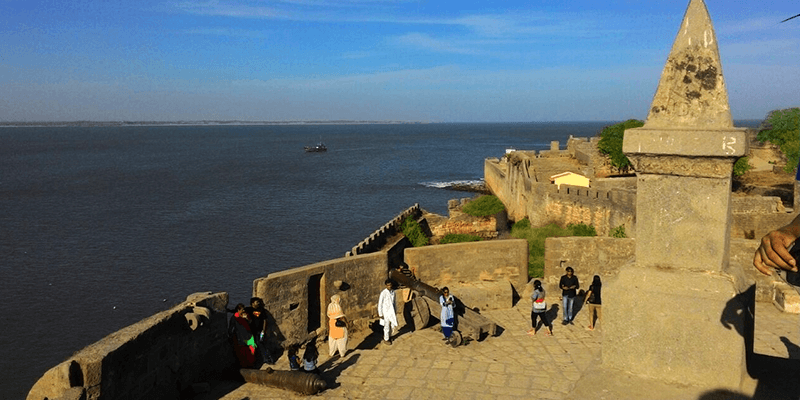 So, would you like to inhale the fresh, salty, Daman & Diu beach air? Next article10 reasons why you must take a train journey with the love of your life! Nice to have a proper information. I love it very much.